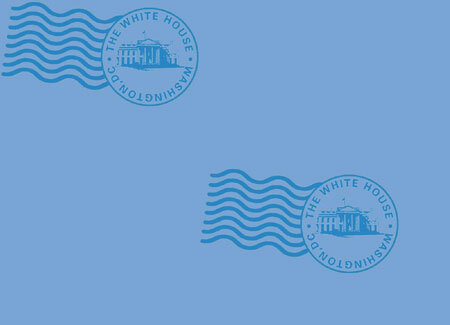 oday, if you want to mail a letter to the President, postage costs 33 cents. However, in the early 1800s, postage costs depended on delivery distance and the number of sheets of paper being mailed. Postage could cost anywhere from 6 to 35 cents for a single sheet of paper; two sheets cost twice as much, three sheets three times as much, and so forth. For working people of that era, who usually earned no more than a dollar a day, mailing a letter was very expensive. Over the decades, as wages rose and as mail delivery became more efficient  evolving from horseback, stagecoach, and steamboat to railroad, automobile, and airplane  postage became more affordable, and mail to the President gradually increased. When Thomas Jefferson was President, he received an average of 137 pieces of mail each month. With the advent of the country's railroad system, sending mail and parcels became much more commonplace. When Millard Fillmore was President in the 1850s, he mentioned in a speech the vast amount of mail he was receiving (100 letters a day at the time). President Theodore Roosevelt's popularity sparked an enormous increase in the volume of mail to the White House  so much, in fact, that a special department was created at the Washington, D.C. Post Office just to handle his mail. Some of the most memorable stories about Presidential mail came from a man named Ira R.T. Smith, who worked in the White House Mail Room for more than 52 years, from the Administration of President William McKinley through that of President Harry Truman. Upon his retirement, he penned a book entitled, Dear Mr. President: The Story of Fifty Years in the White House Mail Room. Mr. Smith described the early days of Theodore Roosevelt's Administration as being "like an avalanche." "Everything was turned upside down," he said, "the mail poured in. We began taking on clerks. Before long we had fifty people handling mail. After the first week we were 450,000 letters behind  almost half a million letters that hadn't been touched. We had mail up and down the corridors and even over in the State Department. It took us six months to catch up." One of Mr. Smith's duties included ensuring that nothing in the mail posed a threat to the President or his family. By today's security standards, his methods might seem dangerous and certainly not foolproof. "I listened for ticking, opening packages at the end of a pole and dunked others in oil. Did it for years and never lost a President!" By President Harry Truman's Administration, there was so much mail it had to be delivered to the White House three times a day by truck. Historical records show that President Truman received about two to three times the volume that Theodore Roosevelt did. During President Bill Clinton's two terms in office, he has received more mail than any other President in history. In 1998 alone, he received 1,051,353 e-mail messages and 2,259,308 pieces of postal mail! Mail to U.S. Presidents has not only increased in volume, but the content and language have changed as well. In President Clinton's mail, for example, there are letters regarding the television rating system, teenage smoking, overpopulation, and global warming. However, these types of issues were unheard of in the 1800s when our country was new. Back then, correspondents wrote their letters with a quill pen, and they discussed such issues as slavery, the Louisiana Purchase, or the settlement of western lands.